Are you tired of waiting for your web designer to get around to building you a new landing page for your latest product, promotion or advertising campaign? Did you know coding isn’t required any more? With the latest in landing page creation tools you can easily create your own landing pages. Think you need to be an experienced designer? Not any more. While it helps to know what makes a good landing page, the new landing page creators guide you through the process with drag and drop features. Easily upload your own images or use the free offerings. Resize, move them around, and add text and backgrounds. Not sure you have it just right? Do your own A/B split testing to change elements or compare designs against each other. When you use an ad or email to bring someone to your site, the page you land them on must be exactly what they’re expecting. If your ad is about a particular product you may be able to land them on the product page. But suppose you want to increase conversions for that page? You may want to create more than one version and test it to see which one generates the most sales. The new landing page solutions often include the ability to do split testing without using a separate solution. Why use multiple tools when one can do the job? If your landing page creator is integrated with your email solution, you have all the statistics you need to improve your campaigns located in one dashboard. If you want to run a special on a particular type of product, you may not already have a page on your site that has the product mix or text you need – especially if it is for a holiday promotion. You may want to use images that match that particular holiday on this landing page. By using a landing page creation tool this is easily done without the need of a web developer. 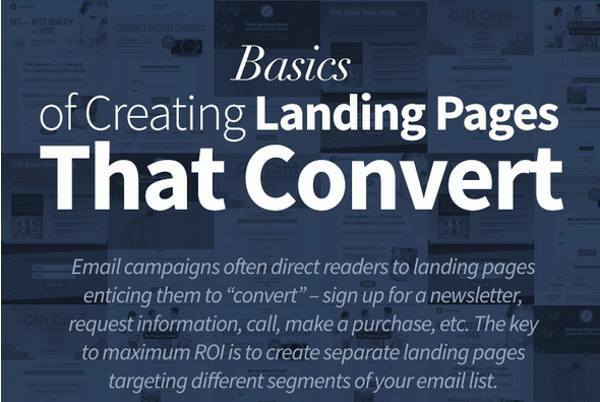 Custom landing pages are essential to convert traffic to sales. With the tools now available, there is no excuse for not creating numerous custom pages for every campaign and testing to improve their conversion rates. If you’ve ever used a program or site that allows you to drag and drop elements onto a page, you already have the skills to create your own landing pages. Templates allow even beginners to create professional-looking landing pages while allowing you to customize the images, coloring, and text. Remember to include social media buttons that link to your social media accounts and social media sharing buttons so that visitors to your pages can share them on the most important social media networks. When you evaluate landing page creation solutions, ensuring mobile responsive optimization is essential. Mobile usage is climbing so having all your pages be mobile responsive is not optional. Videos and images must resize to fit any device and mobile videos should be able to be viewed horizontally on mobile devices. Not all landing page creation solutions are integrated into email solutions. They may not include A/B or multivariate split testing. The solution shown in the video above is very new and has the latest functions which may or may not be available in older alternatives. Succeeding online requires custom landing pages. Fortunately, today it is easier than ever to do it yourself. Just choose a solution and get started right away.